We are happy to announce that with the launch of NMMT (Navi Mumbai Municipal Transport), KDMT (Kalyan Dombivali Municipal Transport) and TMT (Thane Municipal Transport), Google Transit will offer one click solution for planning city commute in Mumbai. These launches along with already launched data for BEST, CR and WR will help commuters and tourists find their way seamlessly around the Mumbai metropolitan region using both trains and buses. Below is one example that demonstrates the ability of Google Transit (available both on desktop and mobile) to combine the schedule data from multiple agencies to create a travel plan for a commuter. 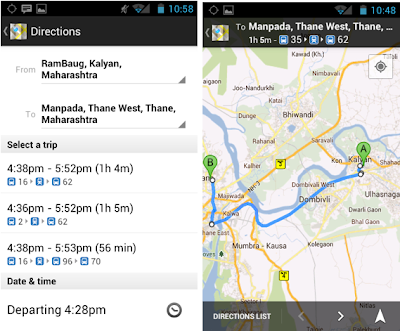 Above are the possible itineraries for a commuter planning to go from Rambaugh, Kalyan to Manpada, Thane. The first suggested trip plan involves taking Bus No 16 (run by KDMT), Local Train (run by Central Railway) and Bus No 62 (Run by TMT). So next time when you want to plan your trip whether from Lokhandwala Complex, Andheri to Godbunder Rd Thane or from Pali Hill, Bandra to Sector 8, Vashi, adopt an environment friendly way to commute by using bus or trains. Rapidly growing Indian cities have transformed into large urban spreads that include city outgrowths and nearby towns. At the heart of all this urban expansion is the transport infrastructure that allows people and goods to move across. City commute has increasingly become complex as people travel longer and use services of multiple agencies to reach their destination. For example, someone living in Kalyan and planning to go to Thane would use services of KDMT (home to kalyan station), CR (kalyan station to thane station) and TMT (thane station to destination). Few tools and information sources are today available to address this complexity of city commute.